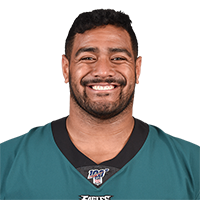 Pick Analysis: Mailata was a professional rugby player in Sydney, Australia before coming to the United States in January of this year to try his hand at American football. The 20-year-old Samoan has been training hard to learn how to use his massive but athletic frame (6-foot-8, 345 pounds) as an offensive lineman. His work at IMG Academy in Florida paid off with an excellent pro day (5.12 40-yard-dash, 4.67 short shuttle, 22 bench press reps) attended by all 32 teams, as well as several team visits. Published: April 28, 2018 at 06:15 p.m. Published: April 28, 2018 at 06:34 p.m. Published: March 30, 2018 at 07:58 p.m.
Watch NFL Network's Shaun O'Hara and New Orleans Saints defensive end Cameron Jordan break down rugby star Jordan Mailata's rugby highlights. Published: March 29, 2018 at 01:07 p.m.
Australian rugby player Jordan Mailata performs a mirror drill at a pro day for international players in Tampa last Saturday. Published: April 9, 2018 at 05:40 p.m.
Former rugby star and NFL Draft prospect Jordan Mailata joins 'Up to the Minute' to talk about his pre-draft journey, teams that have shown interest in him and more. Published: April 19, 2018 at 08:27 a.m.
NFL Network's Peter Schrager explains why Sydney professional rugby player Jordan Mailata making the switch to the NFL and potentially being drafted next week is his underappreciated storyline of the week.